IL ROSSO PITTOR, E ARCH. FIORENTINO. With this caption Vasari identified the framed woodcut portrait that opens the biography of Rosso in the 1568 edition of the Lives. The top of the frame shows La Pittura as a full-length seated woman with a palette, a mahlstick and a brush executing a bust-length portrait of a man propped up on a ledge. On the bottom ledge are seated to the left and right two naked putti, seen from the front and from the back, holding calipers, measuring and drafting instruments, and a book, with a loose sheet of paper with the left putto showing an architectural plan. This is one of several frames used in the Lives that distinguish the various activities of the artist as painter, architect, or sculptor, or a combination of them. Rosso is designated primarily as a painter but also as an architect. 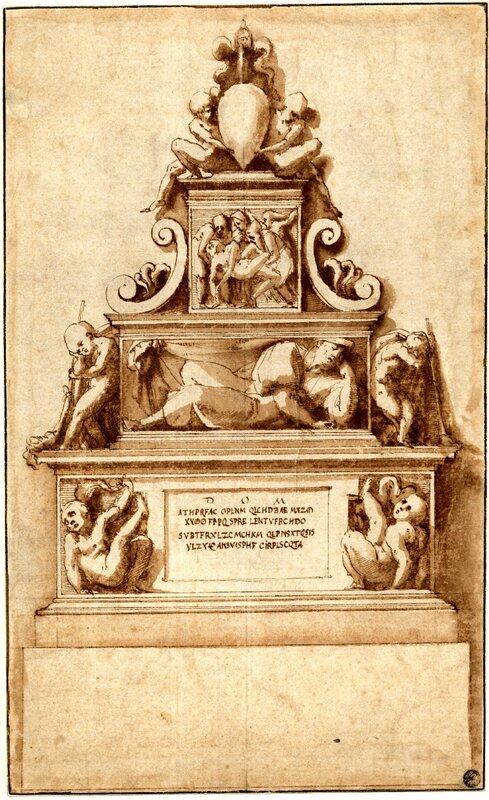 While Vasari mentions specifically only three architectural works by Rosso, he comments at the end of his introduction of the artist: Nell’architettura fu eccellentissimo e straordinario. An exaggeration perhaps but the evidence suggests a serious concern with architecture that should be given attention. This catalogue presents those few works of existing architecture the designs of which can be attributed to Rosso. They are numbered A.1 to A.4, but as their dates, all within his French period, are not precisely documented, their listing here is somewhat arbitrary. All are located at the château at Fontainebleau. As elsewhere in this website the catalogue number prefaced by Fig. is the link to an illustration. Documentary evidence is followed by the arguments devoted to the attribution to Rosso and to the date of the work. For a complete accounting of Rosso’s architectural interests and activity these four catalogued works need to be considered in the context of Rosso’s other architectural designs. 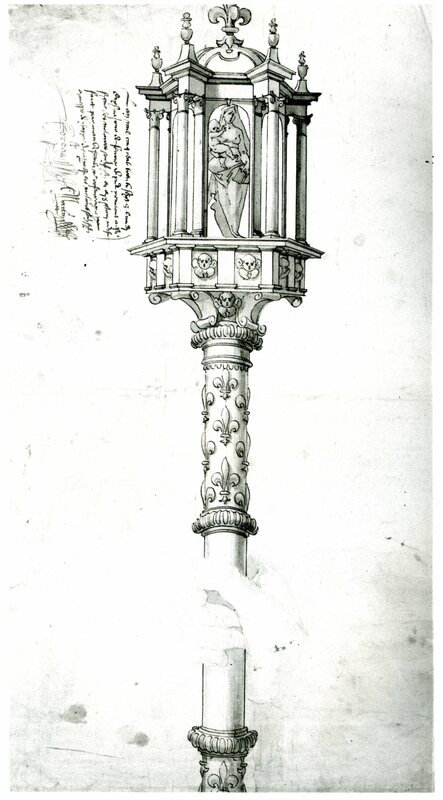 There are four drawings, the Design for a Chapel of 1528-1529 (Fig.D.37a), the Design for an Altar of 1529 (Fig.D.38a), the Design for a Tomb of 1539 or 1540 (Fig.D.81a) and on a smaller scale, the Design for a Cantoral Baton (Fig.D.73a). Several destroyed works of architecture at Fontainebleau need also to be taken into account: the small Pavilion of Pomona (L.39) as well as the large Pavillon des Poêles (L.42). It is also possible that he designed a Garden Gate there (L.40). Some visual evidence exists for these projects. It has also been suggested that he conceived the Gallery of Ulysses, also known as the Long Gallery (L.46), the appearance of which is also partially known. Other lost works give evidence of his architectural activity. 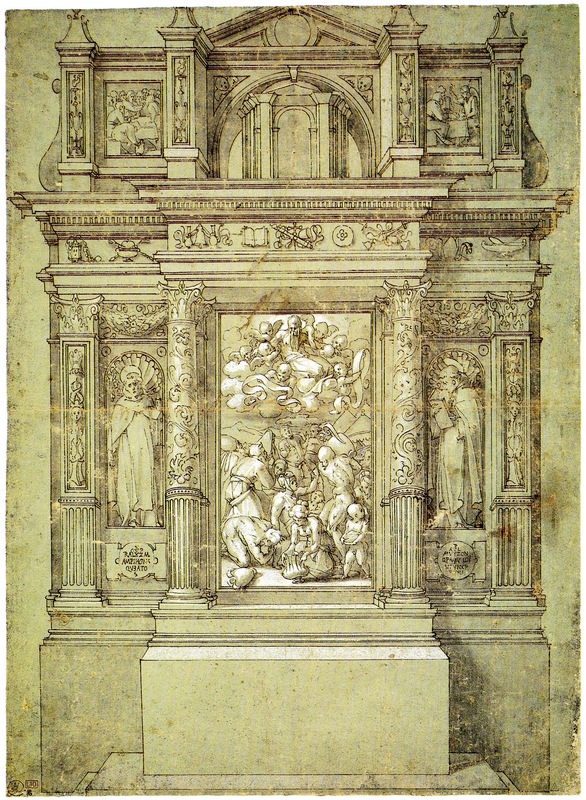 These include three mentioned by Vasari: the Triumphal Arch created for the entrance of Leo X into Florence in 1515 (L.12), a cappelluccia for the Lord of Piombino (L.16), and the design for a cappella for the Fraternita di S. Maria di Misericordia in Arezzo (L.33). 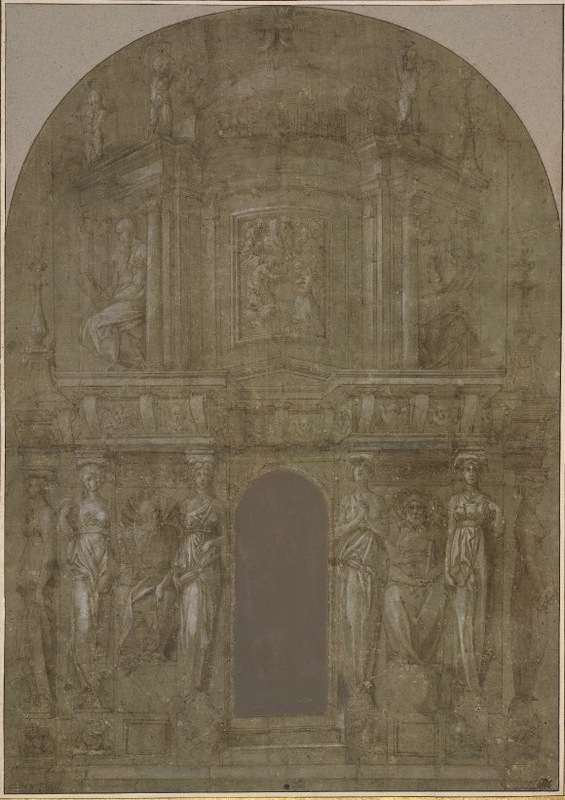 There were also a model for a tomb documented in 1531 (L.37), designs for festival decorations and for triumphal entries, mentioned by Vasari, including those for Charles V’s visit to Fontainebleau in 1539 (L.48 and L.47), a choir screen for Notre Dame in Paris (L.53), and plans for the alterations of vaults in the same church (L.54). An evaluation of his architectural interests would also take into account the architecture in many of his paintings and stucco sculpture, in his figure and composition drawings, and in some of the latter known only from prints.